The world's top protection agent (Ryan Reynolds) is called upon to guard the life of his mortal enemy, one of the world's most notorious hit men (Samuel L. Jackson). The relentless bodyguard and manipulative assassin have been on the opposite end of the bullet for years, and are thrown together for a wildly outrageous 24 hours. During their raucous and hilarious adventure from England to the Hague, they encounter high-speed car chases, outlandish boat escapades, and a merciless Eastern European dictator (Gary Oldman) who is out for blood. Salma Hayek joins the mayhem as Jackson's equally notorious wife. "Thank God you're here, I don't know what I would have done without you." When a great movie establishes a genre standard, it's tough for other movies to break away from the mold. It worked great once. It still worked for a parade of imitators - so why change things up now? The Ryan Reynolds and Samuel L. Jackson action comedy vehicle The Hitman's Bodyguard runs through every play in the Midnight Run playbook - for better or worse. While the comedy is sharp, the action can feel tacked on and only works to keep the film's leads from talking to each other, which is the strength of this paint-by-the-number endeavor. Michael Bryce (Ryan Reynolds) is, or rather was, a Triple-A Rated protection agent capable of protecting any high-level target that needed protection. After his last client got assassinated right before his eyes, that Triple-A Rating isn't worth a whole hell of a lot. After slumming it protecting coked-out investment bankers, Michael's redemption is just around the corner whether he likes it or not. His old flame Interpol Agent Amelia Roussel (Elodie Yung) and her team are ambushed protecting international contract killer Darius Kincaid (Samuel L. Jackson) and she needs his help. The mission is simple. Michael transports Kincaid from London to the Haig in order to testify against dictatorial despot Vladislav Dukhovich (Gary Oldman) who is being charged with war crimes. The problem is, Interpol has a mole and there is an entire team of assassins out to kill Kincaid and anyone who happens to be standing too close to him when the bullets fly. While armed killers would be an obstacle for most people, for Kincaid and Michael, the only real obstacle is not killing each other. The Hitman's Bodyguard is a classic case of the final product perhaps not quite measuring up to expectations. That first poster that made fun of the classic Bodyguard poster featuring Ryan Reynolds carrying Samuel L. Jackson like he was Whitney Houston. I didn't see a trailer. I didn't need to. That image alone was enough to sell me on the idea of a hilarious action comedy. I wish I could say that flick itself matched the image in my head. I probably should have watched a trailer. There's an odd pacing to The Hitman's Bodyguard that just doesn't quite add up. The film's obvious strengths are Reynolds and Jackson and their ability to quip and insult one another. So why does the film work so hard to keep them apart? Going back to Midnight Run as an example of how to do this sort of film right, you keep your central characters together virtually at all times. De Niro's Jack and Grodin's The Duke are joined at the hip from nearly minute one of the film all the way through to the end. Their antagonistic relationship not only makes up a bulk of the great comedy, it also defines their characters and why them being together is important in the first place. it gives them a place to go with the characters. The Hitman's Bodyguard, on the other hand, is content to take numerous deviations away from the central characters. It takes so long for Michael and Kincaid to meet that you almost forget they're in the same movie. On top of that, there are so many time-wasting flashbacks and numbing action sequences that it almost feels like the film ran out of dialogue for these two great actors to share. I won't say that I wasn't entertained by The Hitman's Bodyguard because I was. I laughed more than I didn't. There are some great moments, but those few slices of greatness don't add up to a satisfying whole. When Reynolds and Jackson are on screen, everything runs pretty smoothly. But if you're looking for a truly clever and unique action comedy, this isn't it. It's pretty clunky and wastes its best assets for far too long. At nearly two hours, thirty minutes of that wasted time could easily have been cut and we'd be left with the lean meat that makes the good stuff great. The Hitman's Bodyguard is an action comedy that often forgets how and when to be genuinely funny. When it's good, it's hilarious. When it's bad, it's a rough patch of road. When Jackson and Reynolds are allowed to just do their thing and mercilessly insult one another, the film is hilarious. When the film decides to show us Salma Hayek's prison cell and how she forces her obese cellmate to stand in the corner, the comedy grinds to a dead halt. Why is Gary Oldman even in this thing in the first place if all you're going to do with a performer of his ability is have him sit in a room? Even the film's action sequences - while impressively staged - have a sort of by-the-numbers feel to them that they're not very exciting or even necessary. Why do we endure so many whiz-cut fisticuff hand slap elbow jab bang-bang action scenes? This isn't a Bourne movie. 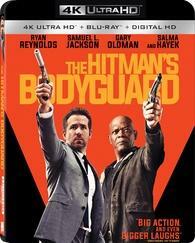 The Hitman's Bodyguard arrives on Blu-ray courtesy of Lionsgate in a two-disc 4K UHD + Blu-ray + Digital HD set. Pressed onto a BD-66 disc, the discs are housed in a standard two-disc black UHD case with identical slipcover artwork. The disc loads to trailers for other upcoming Lionsgate releases before arriving at an animated main menu with traditional navigation options. The Digital HD code is not MoviesAnywhere compatible and only redeems in HDX. The Hitman's Bodyguard makes a nice leap to 4K with this 2160p 2.40:1 Dolby Vision transfer. A number of my quibbles with the Blu-ray transfer are resolved here as the image is allowed to fully strut its stuff. As one of the few modern movies actually finished in a 4K DI, the image can often look drop-dead stunning. Close-ups in particular, give the cast an almost eerily lifelike look as if their faces were right there in the room with you. The first time we meet Jackson's Kincaid is a clear example of this. You can practically count skin blemishes on Gary Oldman's character's face as he was supposed to have endured dioxin poisoning. Black level issues I had during night time sequences are also resolved as shadows are much more stable and don't dip into grays. When the digital grain is applied for certain scenes to give them a bit of grit, it can appear a bit noisier than the Blu-ray, but only slightly. In fact, my only real gripe with this otherwise impeccable 4K transfer is the stylized orange push. The orange skin tones in certain scenes were already a bit distracting on the Blu-ray, but in 4K with Dolby Vision, these characters look better suited for a Peanuts cartoon. Also of note, there are some brightly lit scenes and moments where characters stand in front of bright windows that now look a bit more contrasty than before. It's a minor thing when looking at the film as a whole but still worth mentioning. It's still a great looking image and offers a clear upgrade over its SDR counterpart. Where there is little argument about quality is the superb Dolby Atmos mix The Hitman's Bodyguard gets to enjoy. There is constant surround activity and the mix makes great use of the atmospherics - especially whenever there is an approaching helicopter. It's some wild stuff. Gunfire and explosions erupt out of the speakers and can punch up any action sequence. Dialogue is clean and clear throughout - which is extra important when the quips start flying. The bulk of the comedy and the best moments of the film are when Reynolds and Jackson are bickering. Even in quieter office scenes or when our leads are walking through a field, there is a great sense of atmosphere and space while subtle sound effects keep various channels alive. All In all, this is a pretty terrific audio mix and plays to the film's strengths. The Hitman's Bodyguard comes packed with a few decent bonus features. Sadly, they're not very long and more or less cover the EPK basics. But there is still some decent material here, and the Patrick Hughes commentary track is a good listen. Thankfully the bonus features are also found on the 4K disc and there isn't any need to swap discs. Audio Commentary Featuring director Patrick Hughes. Outtakes (HD 5:23) There are actually a few good bits here that get a laugh. Deleted Scenes (HD 5:01) Not a lot of new or great material here, nothing at least that would dramatically alter the film. Extended Scenes (HD 3:21) Like the deleted scenes, not enough to alter a scene beyond additional padding. How one takes to The Hitman's Bodyguard is going to depend entirely on how one likes their comedy served up to them. If a clever script surrounding well-defined characters with witty banter is your thing, stick to Midnight Run. If you don't mind your comedy improved with a fair share of gross-out dialogue, The Hitman's Bodyguard has a few great laughs in it. Pacing and structure are the biggest problems of the film as it increasingly takes time away from Reynolds and Jackson and how well they work together. Lionsgate brings this film to 4K UHD in terrific order with a great transfer that is an obvious improvement over its SDR counterpart and a hell of a great Atmos audio mix. Bonus features are a bit slim but still worth digging into. At the end of the day, I didn't love the film, but I was entertained. If that's all you're looking for, you should get your money's worth. Recommended.